Reading Buses: mostly Monday-Friday service with early finish, on most routes last buses depart Central Reading around 19.30-20.00. Route 17 has a special half-hourly service from around 21.00 to 23.30 and routes 5, 6, 21 and 26 operate once an hour between around 20.00 and 23.00. Routes 7, 9, 19a/19b/19c and 25 finish at the usual Monday times. Routes 42 and 500 operate to the Saturday timetable and finish at the usual Saturday times. Green Line 702/703: normal Monday-Friday service finishing at the usual time CORRECTION: last 702 journeys: 18.20 Legoland-London Victoria and 20.10 London Victoria-Windsor. All 703 journeys will operate. Thames Valley Buses: Saturday timetable on route 5, finishing at the usual time. Reading Buses: special timetables, generally between 09.00 and 18.00 only, on routes that normally operate on Sundays. Routes 1, 7 and 22 will have a full Sunday service. Greenwave services will operate from 08.15 to 18.45. Green Line 702/703: special service on route 702 only between 09.00 and 18.00. Very limited service between Windsor and Bracknell/Reading. Reading Buses: mostly Saturday timetables. Greenwave will operate a modified Monday-Friday timetable with no service on route 63. On Thursday 24-hour routes 5, 6, 17, 21 and 26 will commence from 04.00, and the usual hourly night service will operate on routes 17 and 21 on Thursday night/Friday morning. Reading Buses: mostly Saturday timetables, including a full evening service and buses after midnight on 24-hour routes 5, 6, 17, 21 and 26. Greenwave will operate a modified Monday-Friday timetable with no service on route 63. Reading Buses: Public Holiday timetables - on most routes this is the same as the Sunday timetable, but route 2 commences one hour earlier and route 17 has a revised timetable between 06.30 and 10.00 with buses every 20 minutes from 07.00 and up to every 10 minutes from 09.00. Normal services resume on Wednesday 2nd January. Reading Buses has a few timetable changes from Monday 25th February, mostly of a minor nature and aimed at improving punctuality. I've seen a post on another forum stating that Reading Buses have purchased Courtney Buses who i believe are based in Bracknell. I’ve seen a post on Facebook about it - very interesting development indeed. Yes, it's definitely going ahead. Courtney Buses is based at the former First premises in Bracknell (prior to that they had a base on an industrial estate near Arborfield). The sale also includes Courtney Bodyworks which offers vehicle repairs and repaints, and is an Authorised MoT Testing Facility. The fledgling Thames Valley Buses operation is Slough is apparently to be incorporated into Courtney Buses. Courtney already operates some services in the Slough and Windsor areas, mostly under contract to Windsor & Maidenhead Council. Although not mentioned, I can also foresee the Green Line services being operated from Bracknell in the future. If we're not careful Reading Buses will have recreated the older Alder Valley North bus company. Just needs to mount a takeover of services in Maidenhead and High Wycombe and it'll be there. Might be hard to dislodge Carousel and Arriva from High Wycombe though. I wonder how much longer First are going to keep a massively isolated operation at Slough going? Surely it must be in line for sale? Could be an interesting battle between Go Ahead (via Carousel) and Reading Buses to buy it though. I can see Go Ahead wanting to establish a nice little west of London operation - gives them access to Heathrow routes and a potential base to attack TfL tendered services in West London. Or even the old Thames Valley Traction Company! Courtney Buses pretty much runs everything in Maidenhead already, with just First's 4 from Slough and Arriva's 39 from High Wycombe being the only non-Courtney routes in the town now. 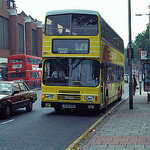 Even if Arriva does decide to pull out of High Wycombe, I can see Carousel stepping in to register replacement routes. I don't think Reading Transport Ltd. has any desire to step on First's toes. Admittedly they have taken on First routes, but these were routes that First was abandoning anyway. RTL houses the RailAir fleet at its Great Knollys Street depot in Reading and has had a full servicing and maintenance contract for the vehicles since 2012. And from what I have read elsewhere, the core Slough operation is profitable and not troublesome to manage (even from Southampton!). I wonder how much longer First are going to keep a massively isolated operation at Slough going? Surely it must be in line for sale? Could be an interesting battle between Go Ahead (via Carousel) and Reading Buses to buy it though. I can see Go Ahead wanting to establish a nice little west of London operation - gives them access to Heathrow routes and a potential base to attack TfL tendered services in West London. Rotola could be a potential Slough First replacement as well. You remind me of how First Slough, Carousel Slough - High Wycombe, Thames Travel Reading - Oxford and Arriva Reading - High Wycombe could soon be the only main routes in Berkshire not run by Reading Buses or a subsidiary of theirs. Stagecoach South operates a couple of routes into Newbury - 7/7A from Andover and 'Link' from Basingstoke. Arriva also operates High Wycombe-Maidenhead (route 37), and Go-Ahead owned Swindon's Bus Company (Thamesdown Transport as was) has routes into Hungerford. 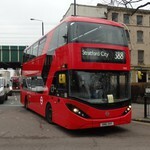 And don't forget the 81 to Slough which is a TfL service! There seems to have been some recent vehicle activity in Newbury, following Reading Transport Ltd's acquisition of Weavaway's Newbury & District operation. Reading Buses is making timetable and fare changes to its "Greenwave" routes along the A33 corridor, to commence on Monday 8th April. Buzz 42 also has a new timetable at peak times. 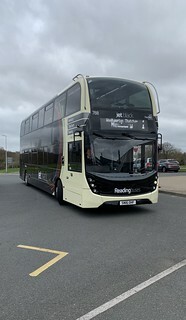 Reading Transport Ltd. is co-ordinating its Newbury & District operations more closely with its jetblack 1 and Kennections services in the Newbury area. Fares will also be co-ordinated. 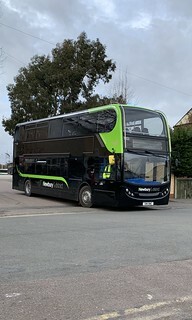 From Tuesday 23rd April N&D routes 1a and 1c will be co-ordinated with jetblack 1 to give an even 15-minute daytime frequency as far as possible between Newbury Wharf and Thatcham Broadway. Fares and passes will also be brought into line with jetblack 1 and tickets will be inter-available. N&D routes 1b and 1d will no longer operate. 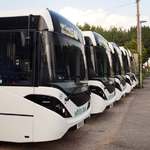 N&D route 103 (Newbury & Greenham Business Park) will have a revised timetable and fares. N&D routes 123 and 124 will be discontinued as they duplicate Kennections services. Passengers can use Kennections 8 or Newbury & District 103 to Greenham, Kennections 9 to Newbury Racecourse, Kennections 2 to Wash Common and Kennections 4 to Speen.